These years of liturgical reform have stimulated a lively musical response. There is today a great variety of settings of the new Eucharistic texts. At the same time there is a growing need for some stability: for more settings that will bear regular repetition. 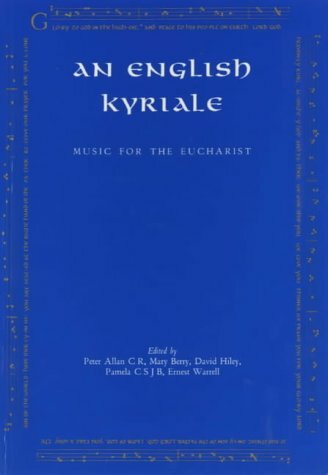 A "Kyriale" (from "Kyrie Eleison", meaning "Lord, have mercy") is a collection of musical settings of the five chants that can be sung by the people during the Eucharist, the traditional names for which are the Kyrie itself, the Gloria, the Credo, the Sanctus, and the Agnus. This English Kyriale meets the needs of today's church by adapting the melodies from the English "Use of Salisbury" and from Continental sources to the modern translations. Here is music for all the congregation - to be sung preferably without accompaniment. Some of the melodies are very simple: others require a deeper familiarity before they can be sung with confidence. Together they form an exciting introduction to the riches of the church's chant. A recording of the music in this book can be obtained from Mirfield Publications, House of the Resurection, Mirfield, West Yokshire, WF14 0BN.